Forget about internet speed, can we just have reliable connectivity? In the last month, I have been making a number of work-related skype calls in different corners of the city. Mostly in Bandra, but sometimes in Andheri, Goregaon, Chembur - all are core, highly populated and well connected Mumbai suburbs. You would never think that an internet problem could crop up in such locations. Well, it has. Skype is not the most brilliant video conference client, but it's the best of the pack currently. It is also an acid test for the stability (more than speed) of an internet connection. In my experience Skype can run satisafctorily on a connection speed upto 256K - provided it is steady. It can certainly work on a 3G signal if WCDMA/ HSPA is not available. However, if the connection fluctuates or drops, it plays havoc with Skype. This is the problem that I have been experiencing. I use a variety of internet options on the move - an Airtel (WCDMA) dongle, a TATA Docomo (CDMA) dongle and two HSPA/3-G enabled SIMs from Airtel. Each one acts up in a different place. 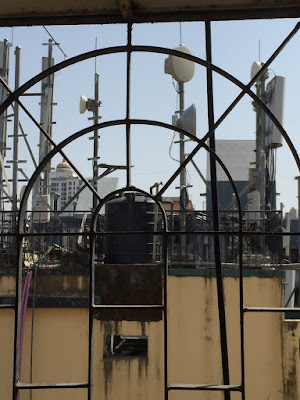 Airtel roams well (though at extra charge) but has patchy connectivity in certain parts of the city including Sewri, Lalbaugh and the higher stories of tall buildings including my own house. As a telco, they have to provide a signal in all parts of the city, but I notice that in these areas, the signal stays at 2-bar strength, and drops frequently from 3G to Edge. Under these conditions, your regular mail and WhatsApp will not be affected, websites will load slowly, but Skype will drop perenially and will show you as 'offline' - the connectivity is so poor that you will get signed out. Tata DOCOMO generally has a steady connection (it stays either fast or slow) but virtually nothing works on the slow connection. It drops in high buildings, and in certain parts of Bandra, especially Carter Road and Sherley Rajan Road. Our branch office is there, so I know what I am talking about - we had to surrender our Docomo connections on account of not working in either our office, or my home! Which is a shame, because otherwise it is a decent connection and it roams for free. Reports show that Internet speeds in India are slowly improving - in Q1 2013, Akamai reported an average speed of 1.3 Mbps. But I realise that speed is actually not a good measure. Airtel sometimes gives me 6 Mbps, but where is the connectivity when I need it? I pay nearly Rs.4000 a month across my various internet connectivity options. There is virtually no operator I have not tried in Mumbai, and I cannot say that any option has really been superb. I am making do with the least-worst rather than the best! Broadband-like stable connections are the need of the hour more than explosively fast ones. Till we get them, our productivity will suffer, and our frustration will mount.